Sennheiser VMX100 - posh bluetooth ? The VMX100 is beautifully presented, you often hear me talking about how awesome it is to unbox Apple products, well this is a very similar experience. It is available in black or titanium colour finishes. The titanium version that I was sent looks really cool. Upon opening the box and removing the headset, you are presented with tiny boxes containing the included accessories. These being the USB charger cable (so you can charge on your Mac or PC) and the main plug, which accepts the same USB cable for charging. The included Quick Start guide shows you how to turn on the headset and pair it with your mobile phone. So simple, that I was up and running in under one minute. The headset is a one piece design, with an answer/end call button, a rocker switch for volume, but no on/off switch. This is the really cool part, to turn on and off, you simply swing the microphone out, fit the headset to your ear and voila, you are in action. 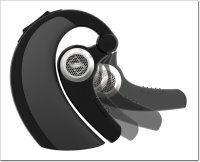 The swing out mechanism is really smooth and also moves on the other axis to allow it to fit comfortably on your ear. Nothing actually pokes into your ear canal, so no rubber sleeves to contend with, and I must say this was a welcome change and very comfortable in use. Where the VMX100 justifies its price tag is with the dual microphone technology, that claims to give crystal clear sound. Well, once connected to my iPhone, I must admit that the clarity on the calls I made was nothing short of superb. On the receiving end, the earpiece was very clear indeed, and when at the other end of the call, the microphone delivered impeccably with no distortion or hiss at all. Full credit to Sennheiser on this one, I was very impressed. Claims of 100 hours of standby and 5 hours of talk time were also pretty much spot on. I would go so far as to say that the standby time is considerably greater, whereas the talk time for myself was around the 4 to 4.5 hours mark. The only area where I felt let down was the reception range. Although nothing is quoted on the manufacturer website, other headsets I have tested have managed up to 10 meters before audio started breaking up. The VMX100 struggled to get anywhere near this. At around 3 meters there was slight break up in audio, and if I went beyond 5 meters or added a wall into the equation, it was not a nice experience. This is not a deal breaker though, as most of the time your mobile phone would be in your pocket or on the dashboard in the car, so never more than a couple of meters away. Would I spend my hard earned cash on the Sennheiser VMX100? If it were my money, then yes, the VMX100 is very good at what it does. The design and comfort are pretty much spot on. The audio clarity is excellent and in day-to-day use I had no real problems with it. If you want something that stands out from the crowd, the VMX100 is a good choice. If your budget is tight, there are plenty of other bluetooth headsets on the market. They might not be as good, but they do the same job, so unless you are going to call Mariah and ask her to sing to you, then you could save some of that hard earned cash. Price: £80.00 headset only : £100 black headset, car power lead, hard case.